Choisissez un mimétique ... Acantholycus elegans Murray Amphix discoideus (Fabricius, 1801) Aplosonyx albicornis (Wiedemann, 1821) Aplosonyx speciosus Baly, 1879 Bibionidae Bombus sp. 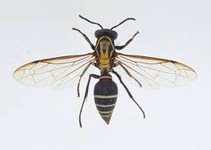 Bracon sp. Braconidae Callichromopsis furcifera (Aurivillius, 1922) Calopteron apicale Guérin-Méneville, 1830 Calopteron bifasciatum Gorham, 1880 Calopteron brasiliense Castelnau, 1840 Calopteron cyaneum Erichson, 1847 Calopteron divergens Gorham, 1880 Calopteron fallax Kirsch, 1865 Calopteron fasciatum (Fabricius, 1787) Calopteron flavocinctum Bourgeois, 1905 Calopteron pallidum Gorham, 1880 Calopteron planulum Gorham, 1884 Calopteron pleioxanthum Kirsch, 1865 Calopteron scutellare Kirsch, 1865 Calopteron serratum (Linné, 1758) Calopteron sp. Calopteron textile Bourgeois, 1899 Calopteron variegatum Kirsch, 1865 Camponotus sericeiventris (Guérin, 1830) Camptotypus sp. Cantharidae Caritheca mouhoti (Baly) Cephalodonta sp. Cephalodonta spinipes (Fabricius, 1794) Cephalotes sp. Chauliognathus fallax Germar, 1824 Chauliognathus nigrocinctus Gorham, 1881 Chauliognathus sp. Comusia mimica Vives & Heffern, 2012 Corynomalus discoideus Cratosoma sp. Crematogaster sp. Culex sp. Curculionidae Cyphus myrmosarius Perty Dactylispa longicuspis Gestro, 1897 Demonax mustela (Pascoe, 1858) Eleodes longicollis LeConte Emplectus sp. Erotylidae Erotylus sexfasciatus Fabricius, 1792 Erythroplatys corallifer (White) Eubaphe unicolor (Robinson) Evaniidae femelle fourmi Heilipus sp. Helogria pruinosa (Chevrolat, 1841) Helops sp. Hemipepsis (Moropepsis) avicula (Saussure, 1867) Homophoeta octoguttata (Fabricius) Hypodynerus sp. Ichneumon sp. Ichneumonidae, Hymenoptera Java rizali (Banks, 1934) Leptalea gracilis (Fabricius) Leptothorax isabellae (Wheeler, 1908) Leptothorax sp. Lycochoriolaus xantho (Bates, 1885) Lycostomus femoratus Schaeffer Lycostomus lateralis (Melsheimer) Lycus (Acantholycus) latissimus v. praemorsus Dalman Lycus (Haplolycus) sinuatus Dalman Lycus arizonensis Green Lycus fernandezi Dugés Lycus lateralis (Melsheimer) Lycus loripes Chevrolat, 1834 Lycus sanguinipennis (Say) Lycus semiustus Chevrolat, 1834 Lycus simulans Schaeffer Lycus sordidus Gorham, 1880 Lycus sp. Lygistopterus rubripennis (LeConte) Malacoscylus sp. mâle Megachile sp. Megalopus sp. Megatracheloides chloris (Faust, 1889) Melipona sp. Metapocyrtus lindabonus Schultze, 1922 Metapocyrtus sp. Methoca sp. Metriorrhynchus sp. Mordellistenus atripennis Champion, 1891 Mordellistenus rubricollis Champion, 1891 Moustique Mutillidae Mydidae Myrmecia flavicoma minuscula Forel, 1915 Myrmecomaea raffrayi Fairmaire Myrmecomaea sp. Naedius elegans Lane & Moure Nemognatha caeruleipennis Perty, 1830 Nemognatha zonitoides Dugés, 1877 Neotylodes errans (Boheman) Octogonotes sp. Olesterus australis Gorham Pachyrrhynchus argus Pascoe, 1871 Pachyrrhynchus cabrasae Rukmane & Barševskis, 2016 Pachyrrhynchus chamisoni Schwarze Pachyrrhynchus congestus ssp. pavonius Heller, 1921 Pachyrrhynchus dohrni Behrens, 1887 Pachyrrhynchus erichsoni Waterhouse, 1841 Pachyrrhynchus gemmatus Waterhouse Pachyrrhynchus gloriosus Faust, 1895 Pachyrrhynchus halconensis Schultze Pachyrrhynchus modestior Behrens, 1887 Pachyrrhynchus orbifer azureus Schulze, 1922 Pachyrrhynchus orbifer Waterhouse, 1841 Pachyrrhynchus reticulatus (Waterhouse) Pachyrrhynchus rosemaculatus Waterhouse, 1841 Pachyrrhynchus samarensis Schultze Pachyrrhynchus sp. Pachyrrhynchus speciosus Waterhouse, 1841 Paraponera clavata (Fabricius, 1775) Pelonides Kuwert Pepsis sp. Pertyia sericea (Perty, 1832) Pheidole sp. Photinus discoideus (Sahlberg) Photinus sp. Photinus vittiger (Gyllenhal) Planodema flavovittata Breuning, 1947 Plateros sp. Polistes instabilis Sauss. Polistes sp. Polybia emaciata Lucas Polybia liliacea Saussure Polybia nigra Saussure Polycatus sp. Polyrhachis militaris (Fabricius, 1781) Polyrhachis sp. Priotelus sp. Pseudodemonax confusus Vives & Heffern, 2012 Pseudomyrma gracilis subsp. mexicana Roger Pseudomyrmex triplarinus (Weddell, 1850) Ptychoglene coccinea (Edwards) Pyractonema sp. Pyrrhocoridae Rhytidoponera sp. Sangaris concinna Dalman, 1823 Schizoloma amictum (Fabricius) Scrobiger sp. Seryda constans (Edwards) Stolas latevittata (Boheman, 1850) Stolas latissima Baly, 1872 Synaphaeta guexi LeConte Synoeca cyanea (Fabricius) Thonalmus hubbardi Leng & Mutchler, 1922 Thonalmus sinuaticostis Leng & Mutchler, 1922 Thonalmus sp. Tmesisternus pauli (Heller, 1897) Trogodendron sp. Vespa sp. Virbia ostenta (Edwards) Xenocerus sp.